Julia Reda, writing in her own blog, warns of the dangers of the new EU copyright law. Please share this video and text widely. Julia Reda: For months now I’ve been raising the alarm about the plan to limit the freedom to link that has been slowly but surely making its way through the EU legislative process. 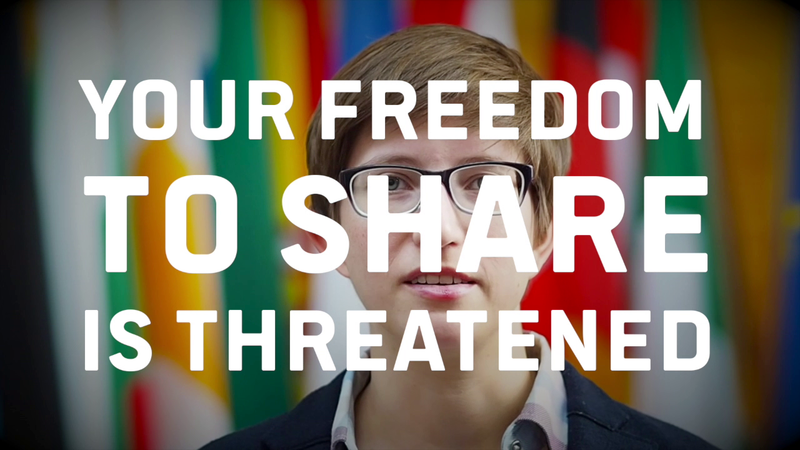 The European Commission and the publishing lobby have accused those of us fighting to save the link of exaggerating the danger that the planned extra copyright for news sites poses. The link wasn’t under attack, they assured us. But it has now become undeniable that it is. They offer internet users the work done by others, the news media, by freely publishing hypertext links to their stories. […] Solutions must be found. […] We strongly urge our governments, the European parliament and the commission to proceed with this directive. There it is, black on white: They fully expect and intend for this law to break the core functionality of the web. They want to outlaw pointing to their articles without their permission. They want to charge for incoming links. The letter suggests their concern is primarily with links from two particular sources: Facebook users and Google. But the law doesn’t discriminate – all links to news websites on the web would be affected by it in the same catastrophic way. This is a prohibition right. It is a right that makes sure there are not platforms coming up everywhere and anywhere that take advantage of content that has been published and make their business out of it. The first and foremost goal is to prevent these exploiting businesses – simply not have them. This exposes the other goal the big publishing conglomerates hope to achieve: Killing off competition in the news sector. They don’t even want to give innovative startups the chance to pay their link ransom – they want to stamp them out. Big publishers want to turn back time to an era in which people were loyal to a single newspaper they had a subscription to. They want visiting the front pages of their brands’ websites to be the only way we can find out what’s happening in the world. That requires eliminating apps and sites that provide what many readers prefer: A selection of links to news from multiple sources tailored to one’s personal interests. The fault line here does not run between journalism and online platforms, as lobbyists like to paint it: It’s between a few giant publishing houses and everyone else. Aggregators and social networks have created a level playing field that has allowed smaller, independent and special-interest news sources to grow. These sites reach the majority of their readership via links on social media and search engines, rather than through direct visits to their websites. Unsurprisingly, innovative publishers and startups are up in arms, warning that the planned law, promoted as ensuring media diversity, would end up achieving the exact opposite: media concentration. Requiring permission for links and suppressing new ways to stay informed: The extra copyright for news sites is nothing short of an attack on the open and decentralized web – in concert with the plan to force online platforms to install censorship machines. It’s true that the news industry is in financial trouble. We need to think creatively about how uncompromising, in-depth journalism can be funded in the future – we certainly need it more than ever. But breaking the web and killing innovation is unacceptable, and would actually backfire on quality journalism and reduce media pluralism. The European Parliament and the Council will make a decision soon – between this law and a sensible alternative. Called the “presumption rule”, it would help publishers enforce existing copyrights without restricting linking. The presumption rule fulfills what the European Commission has all along claimed to be the purpose of the law. Now that no doubt remains that the publishing lobby’s intentions go much further, the Commission needs to put its cards on the table: If it continues to push for the neighbouring right, it confirms that it too wants a “link tax”. If the goal is merely to allow publishers to enforce copyright, like they say, they should support the presumption rule. The crucial vote is coming up in the Legal Affairs Committee (see the schedule here). In that committee, the conservative EPP group, the spokesperson for the liberal ALDE group and French S&D group members support the extra copyright. In the Council, the governments of France, Germany, Spain and Portugal are pushing for it. If you are against this plan, the SaveTheLink campaign has a tool to contact your representatives – and spreading this article via links is and will stay free.